Governments are increasingly using the digital space as the main avenue for disseminating fiscal information. 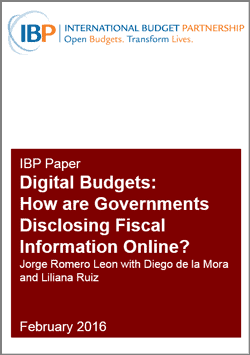 Despite the ubiquity, there have been relatively few attempts to systematically examine government practices in disclosing budget information online. Developing a better understanding of how (and how well) governments are using websites and other online tools to make budget information available to the public is therefore both crucial and timely. Scope: the breadth of the information disclosed online by examining the overall completeness of the budget information and the comprehensiveness of the information. Accessibility: the extent to which governments facilitate public access to the information and whether it is comprehensible and easy to use. This includes an examination of the tools available to interrogate the data, whether data is machine readable, and whether guidance on how to use data is provided. Reliability: the extent to which online disclosure practices are in place to facilitate trust and confidence in the information and data disclosed by governments. This includes examining whether the date of publication is given, whether data sources are identified, and whether changes to the data are logged and retrievable. Feedback: the extent to which mechanisms are in place that allow users to respond to the information presented. This includes whether users can request assistance and guidance, as well as whether user statistics are presented.